This tutorial will review the process of pushing content or code between different WordPress websites, using the SitePush staging plugin. This is a valuable feature that allows you to work on your website’s development on a test copy, without affecting your main website until you are ready. With the use of the SitePush staging, you can push different type of content or code from one WordPress instance to another. To achieve that, you will have to log into the administrative dashboard of your website. Click on the SitePush option on the left-side menu and then SitePush. Source: Choose the Source website. This is the website you are pushing changes FROM. Destination: Choose the Destination website. This is the website you are pushing changes TO. Entire Database: This option will overwrite all of the content on your destination website’s database. All Post Content: Only the posts will be pushed from the source to the destination website. Comments: Only the comments will be pushed from the source to the destination WordPress instance. User & User Meta: The user and user meta information will be pushed between the source and the destination website. 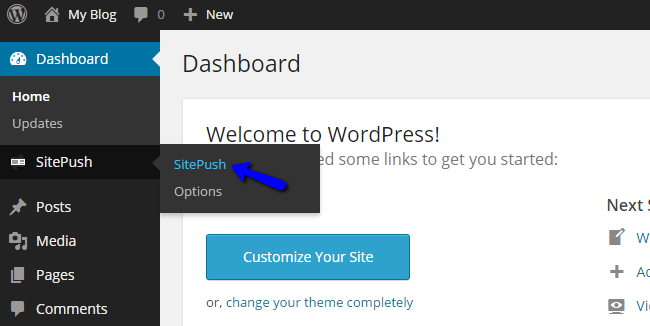 WordPress Options: This option will push all WordPress options from the source to the destination website. Current Theme: This will push the current active theme from the source to the destination website. All Themes: Push all themes to the destination website. WordPress Plugins: Push all plugins to the destination WordPress instance. 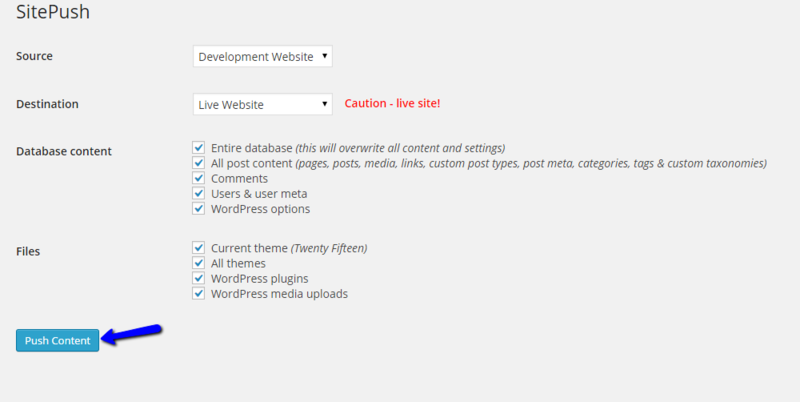 WordPress Media Uploads: Push all uploaded files from the uploads/ directory of your source website to the destination. Push all content from your main website to the staging copy. Make all required changes to your staging copy. Push all content from your staging copy to the main website.